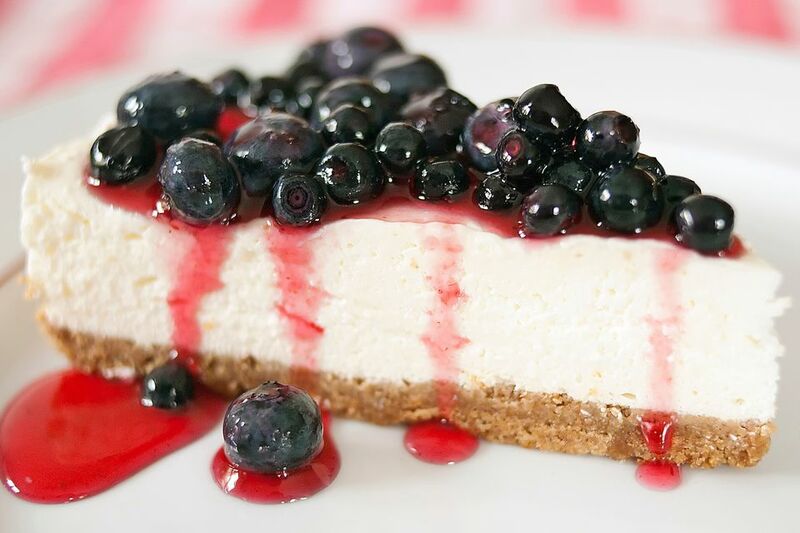 This rich cheesecake is topped with a blueberry glaze. Combine cream cheese and cottage cheese in a large mixing bowl; beat until smooth. Gradually add 1 1/2 cups of granulated sugar, beating well. Add eggs and beat until well blended. Add 6 tablespoons of cornstarch, flour, lemon juice, and vanilla; stir well. Add 1/2 cup of melted butter and the sour cream, beating until smooth. In a 1-quart saucepan combine 1 cup of sugar and 2 tablespoons of cornstarch. Stir in water. Crush 1/2 cup blueberries; add to sugar and water mixture. Cook over medium heat, stirring constantly, until mixture is thickened and begins to bubble. Continue to boil gently for about 2 minutes, or until blueberry glaze mixture is clear. Cool completely.